(1) Regulatory functions of the Notch cell-cell signaling pathway. The Notch pathway is one of a handful of signaling systems that are collectively responsible for the vast majority of conditional cell fate specification events in metazoan development. We have a long history of helping to elucidate the pathway's structure and functions, including the identification of its transducing transcription factor, Suppressor of Hairless [Su(H)]. Our present interests are in (a) understanding how Notch signaling switches Su(H) from being a repressor to an activator, and (b) unraveling structure-function relationships in the Bearded family of proteins, which act as antagonists of Notch signaling and are encoded by genes that are themselves targets of the pathway. (2) Dual enhancers controlling the expression of neural precursor genes. Neural precursor cells, such as those that give rise to the sensory bristles covering the fly's body, express a distinctive set of regulatory genes. We have found that many of these genes are served by duplicate enhancer modules, each of which drives the gene's expression specifically in neural precursors. We are interested both in how the modules encode this specificity, and in the functional advantages of the dual-enhancer control strategy. (3) Role of architecture in the function and specificity of transcriptional enhancer modules. Enhancers make use of particular regulatory "codes" (combinations of transcription factor binding sites) to generate their characteristic expression output. But these codes do not by themselves explain enhancer specificity — the module's "architecture" (the arrangement and spacing of the factor binding sites) typically plays a critical role as well. We are investigating the mechanistic basis for this; in particular, how the constrained spacing of pairs of sites leads to synergies in the action of the cognate transcription factors. (4) Long-term evolutionary conservation of specific cis-regulatory elements in developmental control genes. 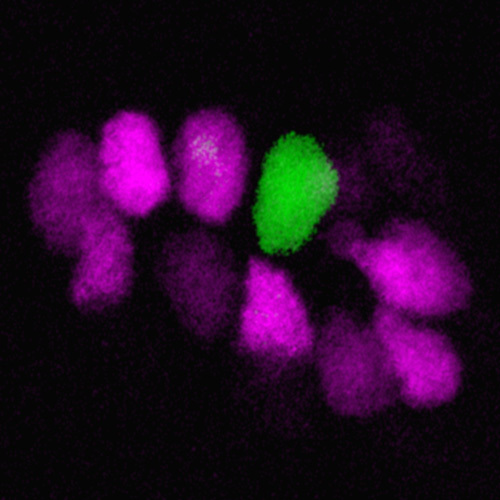 It is now well established that changes in transcriptional regulatory connections are a major engine for the generation of developmental novelty during evolution. We have been looking at the other side of the coin by identifying and studying specific elements of transcriptional regulatory architecture that are ancient and have been conserved in orthologous genes from a deep ancestor. We are particularly interested in the functional basis of this long-term conservation; i.e., what distinctive regulatory capabilities are conferred by these special elements that would account for their durability? Miller, S. W., and Posakony, J. W. (2018). Lateral inhibition: Two modes of nonautonomous negative autoregulation by neuralized. PLoS Genet. 14: e1007528. Smith, A. F., Posakony, J. W., and Rebeiz, M. (2017). Automated tools for comparative sequence analysis of genic regions using the GenePalette application. Dev. Biol. 429: 158-164. Miller, S. W., Rebeiz, M., Atanasov, J. E., and Posakony, J. W. (2014). Neural precursor-specific expression of multiple Drosophila genes is driven by dual enhancer modules with overlapping function. Proc. Natl. Acad. Sci. USA 111: 17194-17199. Liu, F., and Posakony, J. W. (2014). An enhancer composed of interlocking submodules controls transcriptional autoregulation of Suppressor of Hairless. Dev. Cell 29: 88-101. Liu, F., and Posakony, J. W. (2012). Role of architecture in the function and specificity of two Notch-regulated transcriptional enhancer modules. PLoS Genet. 8: e1002796. Rebeiz, M., Castro, B., Liu, F., Yue, F., and Posakony, J. W. (2012). Ancestral and conserved cis-regulatory architectures in developmental control genes. Dev. Biol. 362: 282-294. Nègre, N., et al. (2011). A cis-regulatory map of the Drosophila genome. Nature 471: 527-531. Rebeiz, M., Miller, S. W., and Posakony, J. W. (2011). Notch regulates numb: Integration of conditional and autonomous cell fate specification. Development 138: 215-225. Fontana, J. R., and Posakony, J. W. (2009). Both inhibition and activation of Notch signaling rely on a conserved Neuralized-binding motif in Bearded proteins and the Notch ligand Delta. Dev. Biol. 333: 373-385. Miller, S. W., Avidor-Reiss, T., Polyanovsky, A., and Posakony, J. W. (2009). Complex interplay of three transcription factors in controlling the tormogen differentiation program of Drosophila mechanoreceptors. Dev. Biol. 329: 386-399. Castro, B., Barolo, S., Bailey, A. M., and Posakony, J. W. (2005). Lateral inhibition in proneural clusters: Cis-regulatory logic and default repression by Suppressor of Hairless. Development 132: 3333-3344. Rebeiz, M., Stone, T., and Posakony, J. W. (2005). An ancient transcriptional regulatory linkage. Dev. Biol. 281: 299-308. Reeves, N., and Posakony, J. W. (2005). Genetic programs activated by proneural proteins in the developing Drosophila PNS. Dev. Cell 8: 413-425. Barolo, S., Stone, T., Bang, A. G., and Posakony, J. W. (2002). Default repression and Notch signaling: Hairless acts as an adaptor to recruit the corepressors Groucho and dCtBP to Suppressor of Hairless. Genes Dev. 16: 1964-1976. Rebeiz, M., Reeves, N. L., and Posakony, J. W. (2002). SCORE: A computational approach to the identification of cis-regulatory modules and target genes in whole-genome sequence data. Proc. Natl. Acad. Sci. USA 99: 9888-9893. Barolo, S., and Posakony, J. W. (2002). Three habits of highly effective signaling pathways: Principles of transcriptional control by developmental cell signaling. Genes Dev. 16: 1167-1181. Barolo, S., Walker, R. G., Polyanovsky, A. D., Freschi, G., Keil, T., and Posakony, J. W. (2000). A Notch-independent activity of Suppressor of Hairless is required for normal mechanoreceptor physiology. Cell 103: 957-969. Jim Posakony received his Ph.D. from the California Institute of Technology in 1982. Prior to coming to UCSD in 1985, he was a postdoctoral fellow at Harvard University. In 1986 he was named a Pew Scholar in the Biomedical Sciences. He was elected as a AAAS Fellow in 2011.